COMMENTS:        This trigger occurred at longitude,latitude = 247.52,9.69 [deg]. COMMENTS:        NOTE: This BAT event is temporally(17.0<100sec) coincident with the FERMI_GBM event (trignum=498419532). COMMENTS:        This trigger occurred at longitude,latitude = 284.32,2.83 [deg]. COMMENTS:        NOTE: This GBM event is temporally(17.0<100sec) coincident with the SWIFT_BAT event (trignum=718023). COMMENTS:        The XRT position is 0.71 arcmin from the BAT position. COMMENTS:        The 2nd packet (of 3) was missing in the lightcurve data stream. MASTER II robotic telescope (MASTER-Net: http://observ.pereplet.ru) located in Blagoveschensk was pointed to the GRB161017.74 70 sec after notice time and 96 sec after trigger time at 2016-10-17 17:53:27 UT. On our 3-th (20s exposure) set we found 1 optical transient within SWIFT error-box (ra=09 31 03 dec=+43 08 31 r=0.050000) brighter then 14.5. Dec(J2000) = +43d 08' 30"
with an uncertainty of 3 arcmin (radius, 90% containment, including systematic uncertainty). The BAT light curve showed a multi-peaked structure with a duration of about 160 sec. The peak count rate was ~2100 counts/sec (15-350 keV), at ~0 sec after the trigger. Dec(J2000) = +43d 07' 48.0"
with an uncertainty of 4.9 arcseconds (radius, 90% containment). This location is 43 arcseconds from the BAT onboard position, within the BAT error circle. No event data are yet available to determine the column density using X-ray spectroscopy. The initial flux in the 2.5 s image was 3.24e-09 erg cm^-2 s^-1 (0.2-10 keV). with a 90%-confidence error radius of about 1.10 arc sec. This position is 12.0 arc sec. from the center of the XRT error circle. The estimated magnitude is 13.86. No correction has been made for the expected extinction corresponding to E(B-V) of 0.02. COMMENTS:        The UVOT position is 11.9 arcsec from the XRT position. Dec (J2000): +43d 07' 34.8"
with an uncertainty of 1.4 arcsec (radius, 90% confidence). At 17:52:08.26 UT on 17 October 2016, the Fermi Gamma-Ray Burst Monitor triggered and located GRB 161017A (trigger 498419532/161017745), which was also detected by Swift (Troja et al., GCN 20064). The GBM on-ground location is consistent with the Swift position. The angle from the Fermi LAT boresight is 125 degrees. The event fluence (10-1000 keV) in this time interval is (7.02 +/- 0.43)E-06 erg/cm^2. The 1-sec peak photon flux measured starting from T0+4.3 s in the 10-1000keV band is 5.6 +/- 0.5 ph/s/cm^2. The spectral analysis results presented above are preliminary; final results will be published in the GBM GRB Catalog. We observed the afterglow of GRB 161017A (Yurkov et al., GCN 20063, Troja et al. GCN 20064) with OSIRIS at the 10.4m GTC telescope on La Palma (Spain). The observations started at 04:38:44 UT (10.78 hr after the burst) and consist of 3 x 900 s spectra using grism R1000B, which covers the spectral region between 3700 and 7800 AA at a resolution of R ~ 1000. The r-band acquisition image shows the afterglow at a magnitude of r(AB) = 18.24+/-0.07, as compared to several SDSS stars. The spectrum shows a strong continuum with weak features of SiII, CIV, AlII, and FeII at a common redshift of 2.013, which we identify as the redshift of the GRB. Additionally, we detect two intervening systems at z=0.916 and z=1.370, both with MgII features. We searched for the optical counterpart of GRB 161017A (E. Troja et al., GCN Circular #20064) with the optical three color (g', Rc, and Ic) CCD cameras attached to the MITSuME 50 cm telescope of Akeno Observatory, Yamanashi, Japan. The observation started on 2016-10-17 17:52:42 UT (51 sec after the burst) and we detected the optical counterpart in g', Rc and Ic band. The measured magnitudes were listed as follows. We obtained following results for the magnitudes. We observed the field of GRB 161017A (Troja et al., GCN 20064) with the 3.6m Telescopio Nazionale Galileo (TNG) equipped with DOLoRes. Observations were carried out in the r-sdss filter. Observations started on Oct 18 at 03:51:18 UT (~10 hours after the burst) and consist in a single image lasting 120 seconds. The optical afterglow (Yurkov et al. GCN 20063; Troja et al. GCN 20064; de Ugarte Postigo et al. GCN 20069; Fujiwara et al. GCN 20070) is detected with a magnitude r(AB) = 17.9 +/- 0.1 (calibrated against nearby SDSS stars). The 1-m LCOGT McDonald telescope began observing Swift GRB161017A (Troja et al., GCN 20064) in the SDSS r filter on October 18, 10:03 UT (~0.67 days since the GRB). We detect the optical afterglow (Yurkov et al. GCN 20063; Troja et al. GCN 20064; de Ugarte-Postigo et al. GCN 20069; Fujiwara et al GCN 20070; Melandri et al. GCN 20071) with r=18.95 +- 0.10 mag at 0.68 days mid epoch, as calibrated against nearby SDSS stars. We have analysed 7.6 ks of XRT data for GRB 161017A (Troja et al. GCN Circ. 20064), from 51 s to 46.2 ks after the BAT trigger. The data comprise 595 s in Windowed Timing (WT) mode (the first 5 s were taken while Swift was slewing) with the remainder in Photon Counting (PC) mode. The enhanced XRT position for this burst was given by Beardmore et al. (GCN Circ. 20067). The late-time light curve (from T0+4.5 ks) can be modelled with a power-law decay with a decay index of alpha=1.04 (+/-0.06). A spectrum formed from the WT mode data can be fitted with an absorbed power-law with a photon spectral index	of 1.656 (+/-0.019). The best-fitting absorption column is 7.5 (+/-0.7) x 10^21 cm^-2, at a redshift of 2.013, in addition to the Galactic value of 1.8 x 10^20 cm^-2 (Willingale et al. 2013). The PC mode spectrum has a photon index of 1.99 (+0.10, -0.07) and a best-fitting absorption column of 4 (+20, -4) x 10^20 cm^-2. The counts to observed (unabsorbed) 0.3-10 keV flux conversion factor deduced from this spectrum is 3.2 x 10^-11 (3.4 x 10^-11) erg cm^-2 count^-1. If the light curve continues to decay with a power-law decay index of 1.04, the count rate at T+24 hours will be 0.042 count s^-1, corresponding to an observed (unabsorbed) 0.3-10 keV flux of 1.3 x 10^-12 (1.4 x 10^-12) erg cm^-2 s^-1. The results of the XRT-team automatic analysis are available at http://www.swift.ac.uk/xrt_products/00718023. 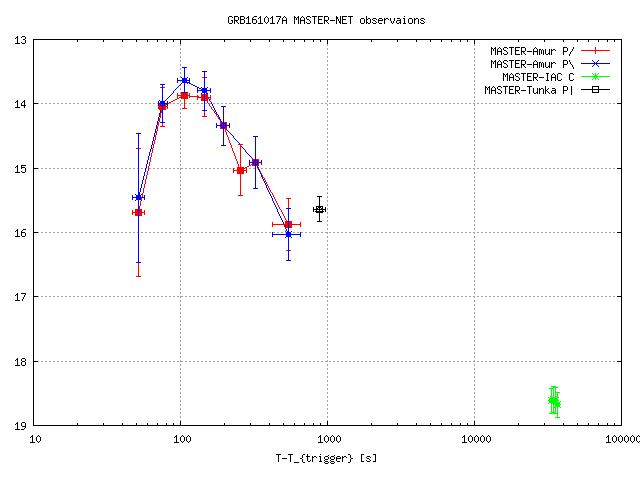 The Swift/UVOT began settled observations of the field of GRB 161017A 68 s after the BAT trigger (Troja et al., GCN Circ. 20064, Yurkov et=20 al., GCN Circ. 20063). The UVOT source described in Troja et al., GCN Circ. 20064, is at a=20 position consistent with the enhanced XRT position (Beardmore et al.,=20 GCN Circ. 20067) and is found to be fading. with an estimated uncertainty of 0.42 arc sec. (radius, 90% confidence). The magnitudes in the table are not corrected for the Galactic=20 extinction due to the reddening of E(B-V) =3D 0.02 in the direction of the burst (Schlegel et al. 1998). Dec(J2000) = +43d 07' 29.0"
with an uncertainty of 1.0 arcmin, (radius, sys+stat, 90% containment). The partial coding was 100%. The mask-weighted light curve shows two main episodes. The first multi-peak episode starts around T-5 sec, and ends at ~T+50 sec. The second relatively weaker episode starts at ~T+60 sec and ends around T+250 sec. T90 (15-350 keV) is 216.3 +- 6.9 sec (estimated error including systematics). The time-averaged spectrum from T-4.88 to T+233.42 sec is best fit by a simple power-law model. The power law index of the time-averaged spectrum is 1.55 +- 0.06. The fluence in the 15-150 keV band is 5.3 +- 0.2 x 10^-06 erg/cm2. The 1-sec peak photon flux measured from T+17.78 sec in the 15-150 keV band is 2.8 +- 0.2 ph/cm2/sec. All the quoted errors are at the 90% confidence level. At 17:52:17 UT on 17 Sep 2016, the Lomonosov BDRG Gamma-ray Burst Monitor (http://lomonosov.sinp.msu.ru/en/scientific-equipment-2/bdrg ) triggered GRB 161017A (E. Troja et al.,, GCN 20064). 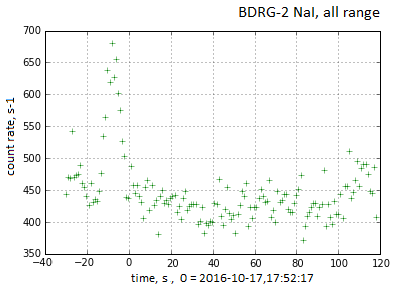 GRB 161017A has several peaks LC, total duration ~100s,the energy range 70-300 keV. MASTER-Amur robotic telescope (MASTER-Net: http://observ.pereplet.ru) located in Blagoveschensk was pointed to the GRB161017A 21 sec after notice time and 47 sec after Swift trigger time at 2016-10-17 17:52:38 UT in two polarizations. On our first (10s exposure) set we marginally found optical transient at Yurkov et al. (GCN 20063) and Troja et al. (GCN 20064) position. The 5-sigma upper limit has been about 14.5 mag . The OT was became brighter up to maximum at 3-4 set . The observations made on zenit distance = 53 degrees, galaxy latitude b = 47 degree. The moon (96 % bright part) is 50 degrees above the horizon. The distance between moon and object is 87 The sun altitude is -37.8 degree. MASTER-Tunka robotic telescope (MASTER-Net: http://observ.pereplet.ru) located in Tunka (Baykal lake) was pointed to the GRB161017.74 75 sec after notice time and 103 sec after trigger time at 2016-10-17 17:53:34 UT. On our second (20s exposure) set we haven`t found optical transient within SWIFT error-box (ra=09 31 03 dec=+43 08 31 r=0.050000). The 5-sigma upper limit has been about 12.5 mag. The observations made on zenit distance = 65 degrees, galaxy latitude b = 47 degree. The moon (96 % bright part) is 50 degrees above the horizon. The distance between moon and object is 87 degrees. The sun altitude is -45.9 degrees. The low mahnitude limit because dense fog due to Irkut (Famost Sibirian river) evaporation. The observations made on zenit distance = 69 degrees, galaxy latitude b = 47 degrees. The moon (94 % bright part) is 75 degrees above the horizon. The distance between moon and object is 82 degrees. The sun altitude is -54.1 degree. Following the detection of GRB 161017A by Swift (Troja et al. GCNC 20064), Fermi (Hui and Meegan, GCNC 20068) and Lomonosov (Sadovnichy et al. GCNC 20075), we observed the optical afterglow (Yurkov et al. GCNC 20063; Breeveld and Troja, GCNC 20074) with the 10.4m Gran Telescopio Canarias (GTC) at the Spanish island of La Palma, starting at 05:59 UT on Oct 18 (i.e. 12.1 hr post-burst), with both the R1000B and R2500I OSIRIS grisms, covering a combined range of 3800-10000 A. The reddest spectrum (convering the range between 7350 and 10000 A at a resolution of 2500) shows the strong Mg II doublet at a redshift z = 2.0127, consistent with the value reported by de Ugarte Postigo et al. (GCNC 20069). We also identify, in the bluest spectrum, other absorption lines (eg. SiII, FeII) and the two intervening systems reported on their GTC (+OSIRIS) R1000B spectrum taken 1.3 hr earlier than us. We observed the optical afterglow of GRB 161017A (Yurkov et al. GCN 20063; Troja et al. GCN 20064; de Ugarte Postigo et al. GCN 20069; Fujiwara et al. GCN 20070; Guidorzi et al. GCN 20072; Breeveld & Troja, GCN 20074; Sadovnichy et al. GCN 20075) with the 3.6m Telescopio Nazionale Galileo (TNG) equipped with the DOLoRes camera in spectroscopic mode. Observations were carried out with the LR-B filter, covering the range 3500-8000 AA. The observations consisted of two spectra, each one lasting 1200 s, carried out at a mean time of Oct 18.1852 UT (~10.58 hours after the burst). The spectrum shows a clear continuum. We detect absorption features consistent with Li-alpha, Si II, C IV and Fe II lines at a common redshift of z = 2.01, together with MgII intervening systems at z=0.92 and z=1.37, in agreement with the results reported by de Ugarte Postigo et al. (GCN 20069) and Castro-Tirado et al. (GCN 20077). report optical observations of GRB161017A discovered by Swift (Yurkov et al., GCN Circ. 20063;Troja et al., GCN Circ. 20064). We observed the field on 2016-10-18.17 UT centered at 09:31:4.65 +43:07:36.34 (J2000), imaging for 20 minutes in the Cousins R filter with the 1.0m JKT telescope (SARA-RM) located on La Palma, Canary Isles, Spain. We detect the fading source at an R magnitude of 17.606 +/- 0.017 using the Andor IkonL 2048 x 2048 CCD (11.6 x 11.6 arc min). The photometric standard GD71 was utilized for calibration. Compared with our previous report (Guidorzi et al. GCN 20072), we estimate an average power-law decay index alpha~1.3 between 0.68 and 1.45 days post burst. We conducted millimetre observations of GRB 161017A (Troja et al. GCN 20064) with the NOrthern Extended Millimeter Array (NOEMA; Plateau de Bure, France) at 93 and 133 GHz. Observations started at 6:51 UT on October 19 (i.e. 1.54 day after the burst). We detect the afterglow at both frequencies. A preliminary analysis of the 93 GHz data reveals a flux density of 1.50 +/- 0.06 mJy. Further observations are scheduled. The long GRB 161017A (Swift-BAT trigger #718023: Troja et al., GCN 20064, T0(BAT)=3D17:51:51 UT; Fermi-GBM observation: Hui & Meegan, GCN 20068; Lomonosov observation: Sadovnichy et al., GCN 20075) was detected by Konus-Wind in the waiting mode. The light curve shows an emission pulse which starts ~10 s before the BAT trigger, peaks at ~T0(BAT)+7 s, and lasts till ~T0(BAT)+28 s.
As observed by Konus-Wind, the burst had a fluence of (8.5 =B1 1.1)x10^-6 erg/cm2 and a 2.944-s peak energy flux, measured from ~T0(BAT)+7 s, of (8.7 =B1 0.2)x10^-7 erg/cm2 (both in the 20 - 10000 keV energy range). Modeling the KW 3-channel time-integrated spectrum (from T0(BAT)-10 s to T0(BAT)+28 s) by a power law with exponential cutoff (CPL) model: dN/dE ~ (E^alpha)*exp(-E*(2+alpha)/Ep) yields alpha =3D -1.25 =B1 0.16, and Ep =3D 289 =B1 73 keV. Modeling the KW 3-channel spectrum near the peak count rate with the CPL model yields alpha =3D -1.17 =B1 0.20, and Ep =3D 404 =B1 136 keV. Assuming the redshift z=3D2.013 (de Ugarte Postigo et al., GCN 20069) and a standard cosmology model with H_0 =3D 70 km/s/Mpc, Omega_M =3D 0.3, and Omega_Lambda =3D 0.7, we estimate the following rest-frame parameters: the isotropic energy release E_iso is ~8.3x10^52 erg, the peak luminosity L_iso is ~2.5x10^52 erg/s, and the rest-frame peak energy of the time-integrated spectrum, Ep,i, is ~870 keV. The AMI Large Array robotically triggered on the Swift alert for GRB 161017A (Troja et al., GCN 20064) as part of the 4pisky program, and subsequent follow up observations were obtained up to 10 days post-burst. Our observations at 15 GHz on 2016 Oct 18.14, Oct 19.33, Oct 21.30 and Oct 25.31 (UT) do not reveal any radio source at the XRT location (Beardmore et al., GCN 20067), with 3sigma upper limits of 132 uJy, 84 uJy, 63 uJy and 78 uJy respectively.